Dr. Koop Berry is a Professor of Government and Foreign Affairs and Director of the Honors Program at Walsh University. She holds a B.A. and an M.A. from Marshall University and a Ph.D. Miami University. 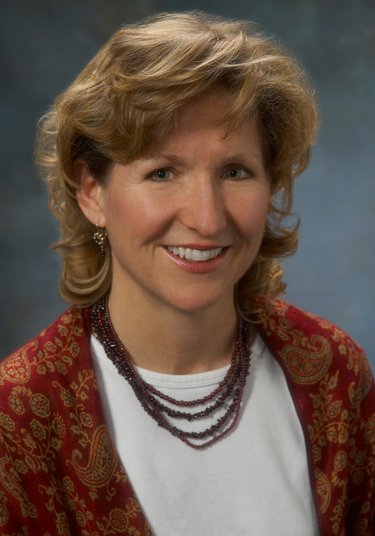 Her professional fields include International and Comparative Politics, International Political Economy, and American and Comparative Foreign Policy. Her research interests have included refugees, the effectiveness of UN peacekeeping, failed states, and militarization in developing countries. Dr. Berry has been recognized for Excellence in Education by Ohio Magazine, named as a Great Educator by Akron Life and Leisure and as Outstanding Educator by the 2006 graduating class of Walsh University. Dr. Berry joined Walsh in 1993. More than two hundred members of the Walsh community came together on Tuesday, February 12, to participate in a student-organized fundraiser for fellow classmate Monica Holliday. 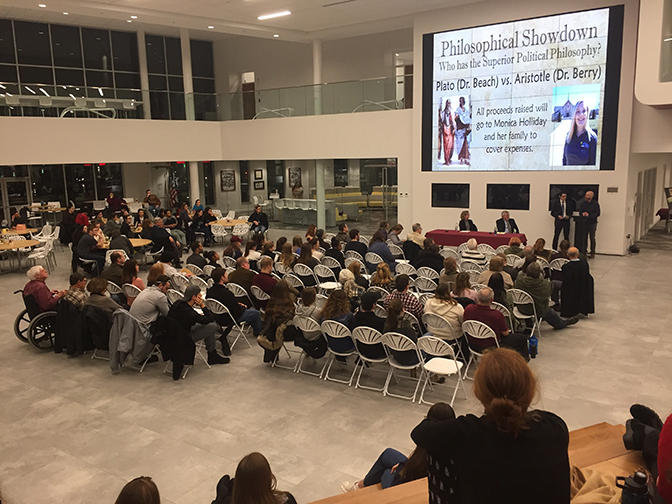 The unique charity debate between “Plato” and “Aristotle” raised over $5,000 in support of Holliday, who was critically injured in a serious car accident over the summer. A rising junior double major in Philosophy and Government and Foreign Affairs at Walsh, Monica was highly involved in activities on campus, such as Student Government, the Student Alumni Association and Dance Marathon, and touched the lives of many at Walsh. The main event of the fundraiser was a debate between Plato and Aristotle to determine which has the superior political philosophy. Plato was represented by Dr. Bradley Beach, Chair, Division of Humanities and Professor of Philosophy, and Aristotle by Dr. Koop Berry, Professor of Government and Foreign Affairs. Dedicated to her studies in both the fields of Philosophy and Government and Foreign Affairs, Holliday also excelled in the classroom. A donation of $2 was collected at the door for a ticket, used for both door prizes of gift cards as well as voting for the winner of the debate. Attendees were encouraged to vote for the winner with their tickets. After the votes were tallied, Dr. Berry on the side of Aristotle was declared the winner. Education students made babysitting available for families to attend. A classic "pass the hat" concluded the evening, with great generosity from the Walsh community. All money raised from the event will be donated to Monica Holliday’s medical bill fund. At the conclusion of the debate, attendees were encouraged to write well wishes for Monica on cards provided. “As a Cavalier, Walsh students are taught to reach out when fellow members of the community are struggling,” said student organizer and junior Theology and Philosophy major Fred del Guidice. “I knew Walsh was extremely generous, but I was overjoyed to find out how eager students, faculty, and administration were to support this initiative." Several departments cosponsored the event: The Renacci Center, The Office of Advancement, The Office of the President, Student Affairs, Student Government, The Student Alumni Association, Sodexo, and Campus Ministry. Donations are still being accepted for this fundraiser. If you wish to donate please contact Student Affairs or Fred del Guidice at fdelgui1@walsh.edu.